The Special Edition range from Jané offers a touch of luxury with the very best in style and design for you and your baby. Using only the highest quality materials and with a choice of two coordinating advanced i-Size safety car seats, we offer you the ultimate and the most technologically advanced travel systems on the market. Minnum Sport pushchair complete with special edition Micro foldable carrycot which provides a practical, lie-flat and light weight option for transporting your baby while he rests, and the Koos iSize, the lightest and most innovative iSize infant car seat on the market complete with the iPlatform, the i-Size isofix car seat base for fitting the car seat in the car in seconds. 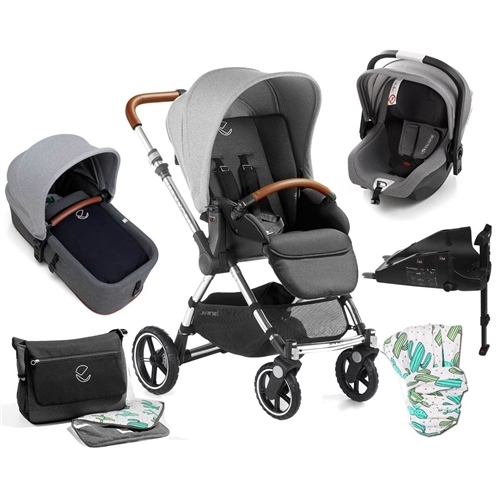 ● Complete with the MICRO Special Edition carrycot, a lightweight, practical and foldable carrycot. ● Complete with iKOOS, an iSize car seat that promotes Isofix, which has less chance of being incorrectly used than belted car seats. Leatherette carrying handle and trimmings. iKoos base uses ultra-quick connectors with Pro-fix locking. Anchored to the car with Isofix and a front anti-rotation leg for complete safety and reliability. This is the safest installation system, as it prevents any installation errors that could affect safety. The lightest and most innovative infant car seat on the market. Complies with the new i-Size (R129) standards, the latest in car safety standard. Greatly improved safety performance and protection for baby's head and neck with new high impact-absorbing material, head protector and built-in side impact protection. Koos iSize coodrinating luxury fabrics and exclusive design details. Micro Special Edition carrycot, uniquely designed and tailored, even with its own leatherette carrying handle and exclusive details. The Micro Special Edition carrycots subtle leatherette and exclusive detailing makes it quintessentially stylish.